HOW TO MAKE CUTE EDIBLE DONUT NECKLACES FOR YOUR BRIDESMAID BESTIES! Use your favorite dried donut recipe to make the dough. 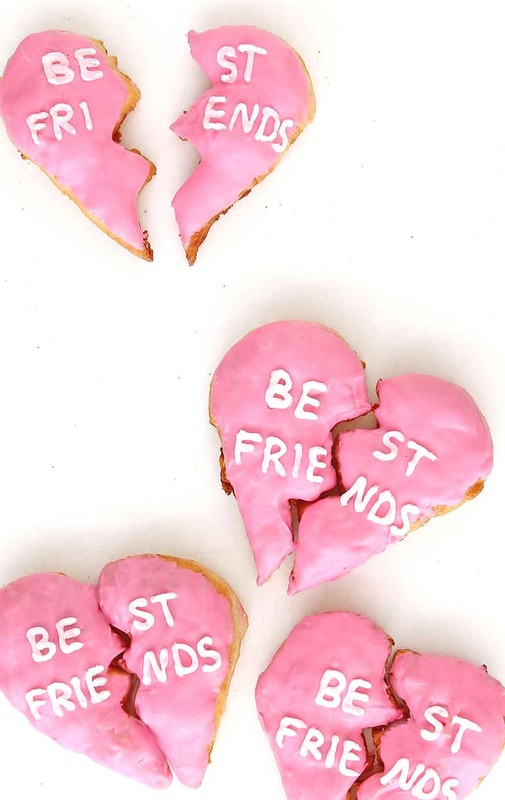 Roll out the dough and use the broken heart cookie cutters to cut out your shapes. Allow to rise for 30 minutes and fry in a pan and frying oil. Allow the donuts to cool completely before icing. With pink icing, dip the donuts in and shake to get rid of any bubbles. Place aside to dry. Put your white icing in a piping bag and cut the tip to get a 1/8″ opening. Pipe the word “best friends” across both donuts. Allow icing to harden and enjoy! Seriously how cute! Who would you share yours with? And don’t forget to share with us by tagging #bespokebridediy on Instagram and Twitter!